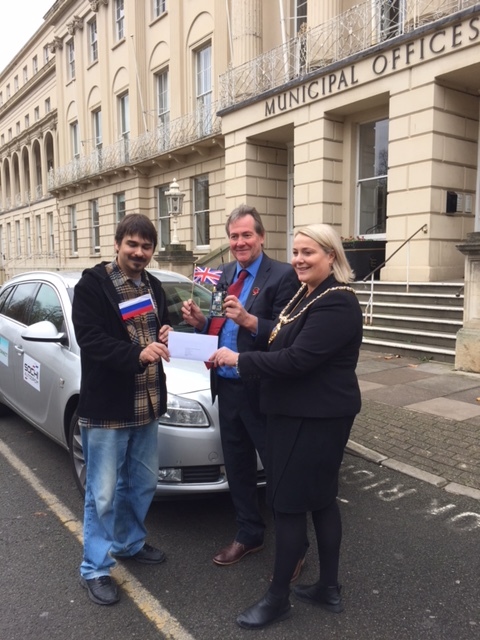 On Tuesday 14 November 2017, the Mayor of Cheltenham, cllr Klara Sudbury, handed a letter of greetings destined for the Mayor of Sochi to Mark Smyth and Michael Lazarev as they embarked on a 3,200 mile road trip to Cheltenham’s twin town of Sochi, Russia. The two men, Mark from Gloucestershire and Michael from Sochi, left Cheltenham with a letter for the Mayor of Sochi expressing our wish to continue co-operation between the two towns. The purpose of their journey is to gather and test data collected on their on-board micro-computer device in urban and rural environments where broadband signals may be poor. The journey will also raise awareness of the link with Sochi and rekindle exchanges and dialogues between the two towns. The journey will finish towards the end of the month in Sochi Autodrom where the Russian Formula 1 Grand Prix is held. Over 420 Cheltenham people have taken part in visits and exchanges during 2017 and this figure doesn’t include all the host families, members of local clubs and societies, Twinning Association members, local companies, volunteers and helpers who are all involved in some way or other to make it so successful. 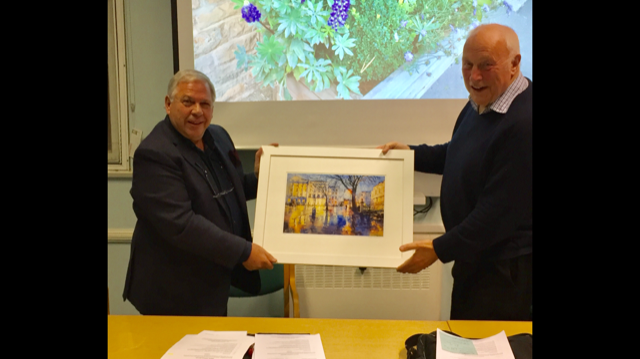 Please see the summary of all our 2017 twinning events with a big thank you to all who have supported Cheltenham town’s twinning links. Posted on February 6, 2014 by cbccomms4 | Comments Off on Winter Olympics here we come! Local residents Stephen Meyer and his son Alex are off to Sochi shortly for the Winter Olympics. The pair will be supporting the GB bob sleigh team and are very much looking forward to seeing Cheltenham’s Russian twin town. 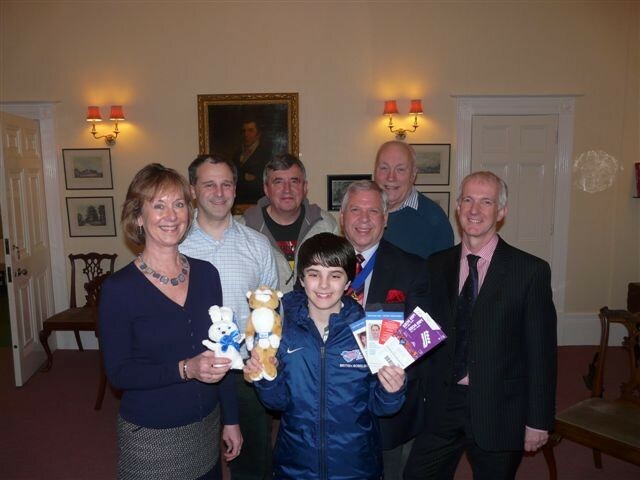 A celebratory send-off with members of the Cheltenham Twinning Association was held in the Mayor’s Parlour with afternoon tea and cakes and the Twinning Officer gave Alex two of the Sochi Winter Olympics’ mascots. The Chairman wished them a safe and enjoyable trip and asked them to come back with loads of photos to share with us all. Comments Off on Winter Olympics here we come! The next winter Olympics will be held in Sochi from 7-23 February 2014 and applications for volunteers are open until the end of February this year – 2013. So visit their website and apply soon if you fancy being part of this exciting event in our twin town. Over 75 twinning visitors from our five twin towns came to Cheltenham to join in celebrating the Olympic torch coming to Cheltenham. The delegation included 20 officials from across our 5 twin towns and 13 members of the Lubo dance ensemble from Sochi, Russia. Other visitors here for the torch relay on 23 May included 32 guests from our German twin town on a tourist trip, nine students from the Heinrich Boll School in Göttingen visiting Bettridge school, as well as two leaders from the Göttingen youth sport exchange. Various events were organised during the four day visit from Monday 21 to Thursday 24 May, including a guided tour of the town, a reception with the Mayor, a coach tour around the Cotswolds and a trip on the steam train. A workshop was also arranged for the morning of Thursday 24 May to give delegates the opportunity to promote themselves and their business and tourism links to local businesses. However, the highlight of the trip was to see the torch passing through Cheltenham and arrive at the racecourse carried by the Queen’s granddaughter, Zara Phillips. The Lubo dance ensemble presented a special dance performance as part of the celebrations at the racecourse as well. It was an unique occasion having representatives from all of our twin towns here at the same time and demonstrates just how strong our international links are and it was wonderful to be able to share this once-in-a-life-time event with them. See our picture gallery for photos of the event. An invitation has been sent to our 5 twin and 2 friendship towns inviting them to come to Cheltenham to take part in the celebrations on Wednesday 23 May when the Olympic torch will come to town. Visitors will be taken to the racecourse to see the staged show and arrival of the Olympic flame. Young people from our twin towns are being encouraged to attend – to promote their city and to participate in a wide range of events with local youngsters, that will be taking place throughout the day.